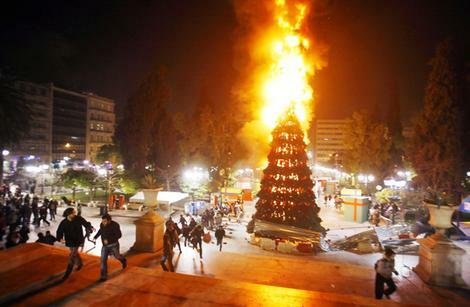 Beware Of Greeks Demanding Gifts | Be Responsible – Be Free! I’ve just been reading what I regard as the most comprehensible article (to a non-economist) I’ve read covering the causes of the current PIIGS financial crisis in Europe. Have a look and let me know what you think. Where were the regulators? Rather than restraining the process, Europe’s politically correct regulators were encouraging it. For instance, European banks were required to treat all euro-denominated public debt as having equal default risk for the purposes of prudential requirements. This made it highly profitable for European banks to replace low-yielding German debt with far higher yielding PIGS debt. I didn’t know that: European bankers forced to treat loans to the Greek government as being an equal default risk to loans to the German government? Gott in Himmel! It’s typical of the kind of elitist thinking that looks at the big picture only, like a Seurat painting, and ignores the human reality which is the dots making up the picture. And dooms itself to failure thereby. It isn’t all bad news; down here, the Australian dollar has been riding high as a perceived safe haven, nudging above US$1.07 yesterday. Our own current economic growth is hitched to the monster Chinese locomotive, which sort of insulates us from the shenanigans in Europe and America. This entry was posted in Australia, China, Europe, United States of America. Bookmark the permalink. We will not default on Aug 2nd it is posturing on both sides to get the most concessions from each other. Although realistically the USA is now bankrupt and is about to discover it can no longer afford it’s military and role as world policeman. But the US treasury printing presses are intact right Crown, in fact you could say they are now well run in and ready to do the serious business.? Service on our debt is something on the order of 6% of tax revenues. There is no reason to default. This is a Democrat scare tactic. What they really don’t want to do is reduce spending to the levels they were just 3 years ago. Spending the taxpayers’ money is the primary source of Democrat power and they are loathe to give it up. As Reagan said in deference to drunken sailors – at least the drunken sailors were spending their own money. Farmerbraun rumour is they have a new dollar awaiting roll out to the banks although us plebs are going to take a haircut at so many cents on the dollar. Of course it will be one to one for the rich and powerful. DrDave real liability’s are at 65 trillion dollars not 13 trillion as published, currently it’s a competition to see whose is bigger. They will not default they will pass a temporary spending measure to keep on negotiating. Yes, this is just a sideshow. The US course is set in concrete; QE3 and inflation. Fortunately the Greek tragedy will force poor Ben’s hand; bugger! He will have to do it to prevent systemic failure. Damn! There is a regional version of this scenario that plays out within Nation/States. Central (and local) governance will often decide that to maintain the productivity of the nation this region should be (re)-integrated into the national economy. Private business will be encouraged to set up there with cheap costs, grants exemptions from regulation. Investment in infrastructure is often made, schools hospitals and roads get built – there is cheap local labour and it fits in with the ideology of the collectivist side of the political spectrum. Sometimes you can find regions that have ‘enjoyed’ several cycles of local improvement. Especially if they contain a potentially ‘separatist’ movement. The regional bloom usually lasts until the next national financial crisis when the tap of local subsidies turns off. With a deeper dip in those regions that were supported. There is another (overlapping?) scale at the level of empires and colonies. The present and the long depression of the late 1800s have interesting similarities? [European banks  required][Europe’s politically correct regulators][to treat all euro-denominated public debt as having equal default risk][This made it highly profitable for European banks to replace low-yielding German debt with far higher yielding PIGS debt. So let’s have a look; clearly matters have deteriorated since 2010. At the peak of the 2010 crisis, the interest rates on the 10 year bonds for Greece, Portugal and Ireland were respectively; 12.4% ; 6.3% ; and 5.9%. The Greek problem triggered QE2 and confidence was restored. Today Greek bonds have hit 20% ; Portugal 11.4% ; and Ireland 11.9%. The amount of the credit default swaps has more than doubled. The Greek economy shrank 4.5% last year and unemployment rose to 16%. Greek politicians must cut 150,000 public service jobs and raise 50 billion Euro by selling off the best state assets; GDP will fall by 4-5% and the GDP/debt ratio will deteriorate further making default inevitable. The only way out would be if the IMF and EC forgave about half of Greece’s debt; the bond holders won’t wear it. The stage is set and the curtain has gone up. Eventually the curtain will fall on this Greek tragedy, but the final act is not yet written. The title is a play on Garret Hardin (a nasty Hobbesian, Malthusian, seeker of global dictatorship)’s essay; “The tragedy of the commons”. This draws the analogy with grazing common land, where a single grazier overstocking will benefit where all of the commoners on that common pay the price for his actions. This relates to poorly defined private property rights, had those rights been properly defined, then the only stock on a piece of land would belong the owner of that land and any ill effects of over stocking would be borne by him alone. Bagus points out that the Yoyo creates just this sort of “Tragedy of” where a European central bank issues debt, but fractional reserve banks in the various member states are also regulated by, and backed by national central banks. I’m not going to give the fractional reserve banks in a fiat currency system with a state monopoly central bank, any sympathy, they are the spoilt brats in a completely rigged system, there is nothing “free” or “private” about it, it is a state sanctioned rip off. The corollary of “too big to be allowed to fail”, is “Too small to be allowed to succeed”, that is us! thee and me. Excess printing of Yoyos was directed to the peripheries of Europe, to the PIIGS, where it fuelled massive mal investment, wealth destruction, and bloated state sectors, the implicit and explicit Yoyo central bank guarantee to those brats of banks and the states, encouraged investors to waste their customers’\ hard earned on PIIGS’ junk bonds – all backed by hard working German tax payers’ savings. There is a precedent for this, with the IMF backing and dollarization of the Argentine Peso, in the early 2000s ( a family member lost several tens of thousands of dollars which were in a supposedly safe bank investment fund when the Argies last iteration of their national defraud and default took place, they’ve been pulling the same stunt for well over 100 years, Peron took it and the mega state sector clientelle to its’ highest level). In the tragedy of the YOYO, the PIIGS got to have credit fuelled booms of mal investment, but all members of that abortion of a political ego trip currency, have to pay the price. “Nartional Debt? We(us little people) owe it to Ourselves(those in the elite, who are too big to be allowed to fail)”. A shame, as otherwise Murray Rothbard’s call to repudiate debt, would be reaching a new and appreciative audience almost two decades after his premature death. Go on Ireland, Repudiate it, Greece to, issue those new Drachma you had printed in Germany, kill that abortion of a political ego trip! It may help them a little, as they have accrued some massive mal investments, which they will have to liquidate sooner or later. farmerbraun the Greek economy was heavily skewed towards shipping and tourism when it was not in the Euro as the Drachma was cheap. Lots of Northern Europeans took cheap holidays in Greece for the sun and apparently nudist colony’s per the holiday snaps my aunt brought back in the 70’s. Thankfully snapped at a distance. On joining the Euro Greece become too expensive so tourism moved to Turkey. Greece is not nor has been a major manufacturing nation and joining the Euro has killed it’s economy. Luton Ian before Person took power Argentina was part of the UK’s unofficial empire and area of major investment from London, there used to an expression “As rich as an Argentine” alas no more. I would guess kitler meant ‘Peron’ The guy in the 1943 military coup who worked with the unions and socialists to try and reverse the dominance a small landed elite had in the Nation. Argentina was one of those ‘independent’ ex-colony states that suffered economically during the 1930s depression. The government response was political oppression and increasing corruption to protect the vested interests. Political instability increases during economic crisis. The existing government fails to meet the expectations of the governed and unrest is either met with repression or political change that is at least perceived to be an improvement. This is perhaps what makes Greece interesting in a way that Ireland, Portugal and Spain are not. Greece has a history of public protest that overthrows governments – and an army that stages coup d’etat. New post up folks. Sorry most of the links in it are Wikis, but I’m a bit rushed at the moment. I’ve checked them and they’re all pretty factual.